Whether its your first visit to Disneyland or your 1,001st (thats right annual pass holders), The Great Disneyland Challenge will create a lot more fun and excitement for your stay at the Magic Kingdom. There is NOTHING to set up! 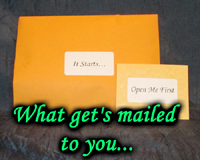 ALL of the materials arrive via US postal service in a sealed package. Youll receive two envelopes - one small and one large. Open the small one first once youre inside the park and YOURE OFF!!! Although we cant share EXACTLY whats inside (that would ruin it for YOU, as well, and we want YOU to enjoy the fun with your family and friends) below is all the information youll need to get the best idea of what it is that we have in store for you. How do I get rid of the obstacles to make my dreams come true? All these questions will be answered and more. How long does it last? As long as youd like. Start when you like. Stop when you like. Start, stop, then start up again, if you like. As long as you keep it all in the same visit at the park (for the sake of the ranking) youre good! This is NOT a photo scavenger hunt. Although we encourage you to take photos along the way to remember the great fun you had, thats not what this adventure is or requiring you to do. There are several photo scavenger hunt products out there (we are soon to offer one ourselves). This adventure is unique, though, unlike anything youve ever done before because its from an original design. During college, I worked at Disneyland (having grown up in Garden Grove, right down the street from the park) and have never stopped enjoying the magic of The Magic Kingdom. During this time I designed treasure hunts for family and friends inside the park and these hunts were a contributing factor to me starting my own design company only a few years later. Although Ive designed hunts of all kinds that have been facilitated literally all over the world, my heart is still fondest of those original hunts I planned at Disneyland so many decades ago. This hunt (and more like them in the future) are a labor of love and I hope that you enjoy them! As part of my adventure hunt design company, I've had another labor of love...antiquing paper. I've made literally 1,000's of maps and clues over the years and developing a paper aging process became crucial (and something that I grew to love.) 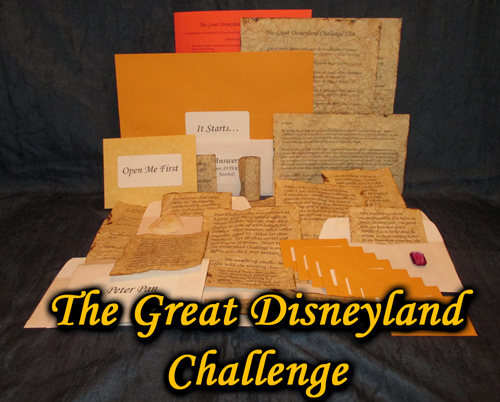 It's a four step process and all of the clues in The Great Disneyland Challenge are hand-antiqued in that process. For over 100 other antiqued paper products, visit our antiqued THEMED BLANK PAPER or LITERARY PAGES.